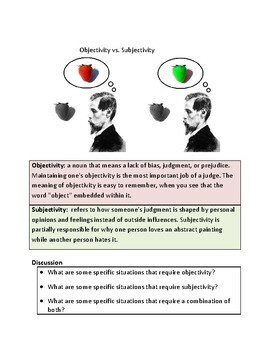 Tone is not an easy concept to describe and explain, yet it is a very important element of academic writing. 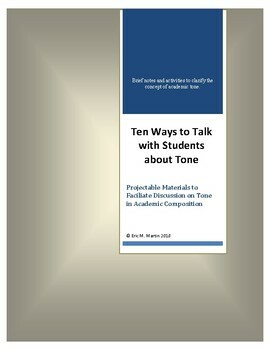 This resource is a set of ten projectable items that each address the issue of tone in academic writing. Most items are a single page. Some are two pages. 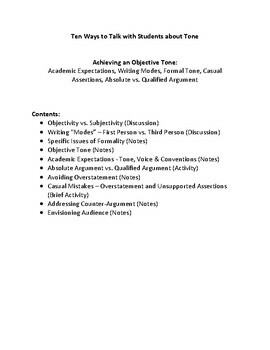 Four of items offer some discussion or activity and the other six are notes. The idea behind this resources is that instructors can use these items one-at-a-time to guide classroom discussion for 5-10 minutes per item. This isn't a lesson plan as much as it's a topically-focused grab-bag of short-duration content - and it's content that's probably helpful for most English teachers. All of the material here is helpful for classrooms that are preparing students to write at the college level. Please be aware that these are not exhaustively detailed materials. Instead, they are "bite sized" items that are designed to help students attain a concrete sense of what we are talking about when we talk about academic tone. 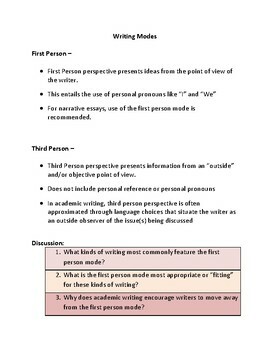 Many style guides cover these ideas, so this resource may perform in your classroom as a supplement to assigned reading in a writing handbook and a way in to larger discussions on academic composition expectations.